“Do-it-all” pedal offers up everything from vintage sounds to modern sludge and doom tones. If you’re familiar with C.S. Lewis’s fictional series, The Chronicles of Narnia, then you’ll know that Tumnus is the diminutive, faun-like character that’s a clever adaptation of the mighty centaur. 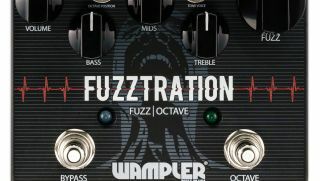 Wampler Pedals, makers of the Euphoria and Sovereign, are proud to release the Velvet Fuzz exclusively (for 45 days) through PGS (proguitarshop) in Oregon. Available globally from September 1, 2013. Wampler Pedals, maker of the Paisley Drive and Ego Compressor, has added the Brent Mason Signature Hot Wired V2 dual-channel overdrive/distortion pedal to its lineup.